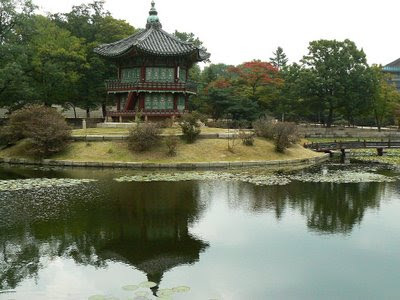 The six-sided Hyangwonjeong Pavillion on an island in a pond at the Gyeongbok Palace (Gyeongbokgung). Ceiling detail in one of the pavilions at the Gyeongbok Palace. 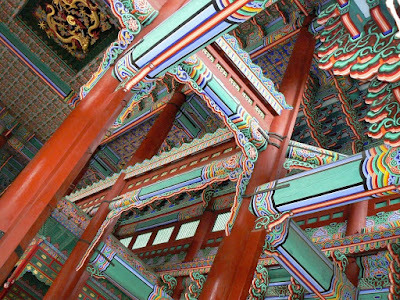 I love the colours and patterns used to decorate Korean palaces and Buddhist temples. I took this long-distance and rather grainy shot of the new Incheon Bridge from the Airport Limousine bus early on Monday morning. If you look closely you can see that the main span (in the center of the shot) is yet to be completed. When finished next year, the 12.3 km toll bridge will link the Seoul–Incheon express-way with the Seohaean express-way, shortening the journey time from Incheon airport to Seoul city by around 40 minutes. I took this photo of someone sitting reading beside the Cheonggye Stream without paying too much attention to the resultant image. 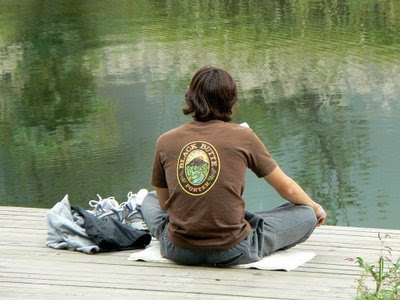 When I had a closer look I realized that the individual in the photo was wearing a T-shirt with "Black Butte Porter" on it. I had not heard of this beverage before, but have since learned that it is named after "Black Butte" cinder cone in Deschutes National Forest, Oregon. Given that I am a fan of the darker brews, particularly Guinness, I am now on a mission to try and find it in Seoul so that I may sample it! I must also say a big thank you to Zsolt over at Budapest Daily Photo for giving me a BFF Award. Thank you Zsolt! 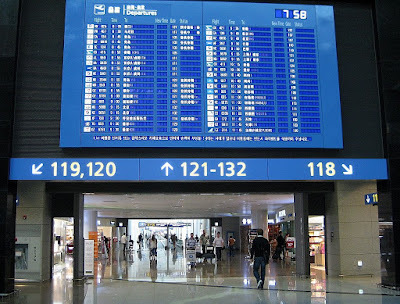 A new terminal opened recently at Incheon Airport. To get to, or from, the gates in the new terminal you have to travel under the airport in a little automatic (and driverless train). The shot above shows one of the large departure information boards in the central corridor of the new terminal. 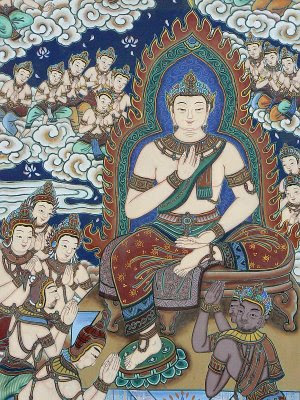 A painted panel on the exterior wall of the Jogye-sa Buddhist Temple. 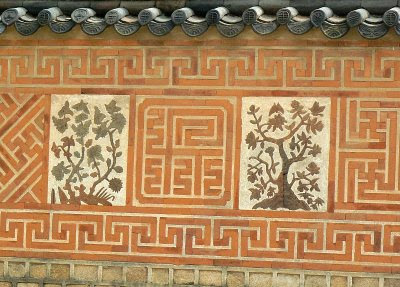 A decorative wall within the grounds of the Gyeongbok Palace. A dancer in traditional dress performs as part of the evening show at the Sanchon Restaurant in Insadong. 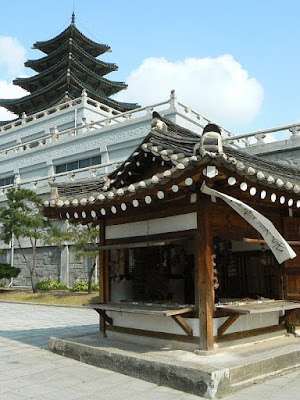 Exterior of the National Folk Museum, located near the Gyeongbok Palace. 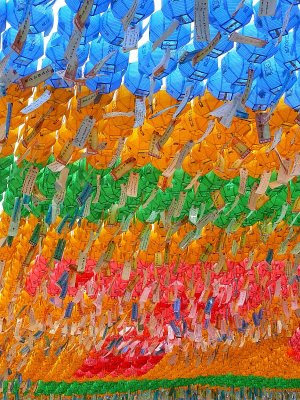 Lanterns at the Jogye-sa Buddhist Temple in Jongno-gu. 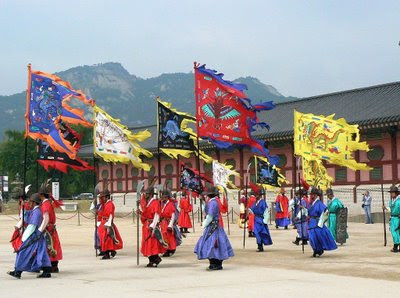 Changing the guard at Gyeongbok Palace (Gyeongbokgung). 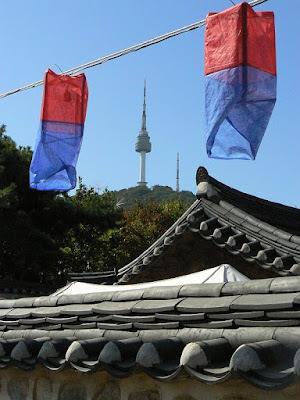 A view of N Seoul Tower from Namsangol folk village. I took this photo in Insadong, just across from Tapgol Park. Apart from resizing it to post here, I've not fiddled with image in any other way. A sign on the Dora Observatory overlooking North Korea. 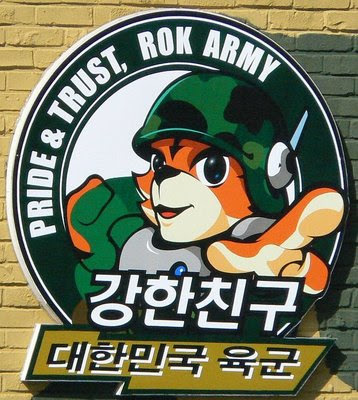 The Korean text actually says something like "strong friend" and then "Korean Army". 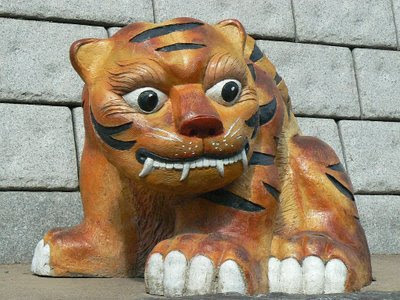 The cute tiger figure is not exactly the most fierce image to project for a military force facing down the North Koreans, but perhaps this is intentional. To date, four tunnels dug by the North Koreans have been discovered under the Demilitarized Zone (DMZ), between North and South Korea. However, it is believed that there may be many more as yet undiscovered tunnels. The 3rd Infiltration Tunnel was discovered in 1978 approximately 50 km from Seoul. The tunnel is about 2 meters across and 2 meters high. It has been claimed that up to 10,000 (although our tour guide said 30,000) fully armed North Korean soldiers could have poured through the tunnel every hour during an invasion. Further details about the tunnel may be seen here. The photo above shows the sign posted near the entrance the walkway that takes visitors down to the 3rd Infiltration Tunnel. 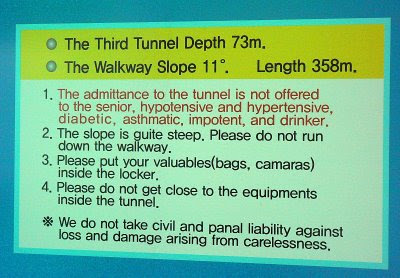 I am curious to know how they ascertain if a visitor is impotent and why it would be a contraindication to entering the tunnel?! Dorasan Sation is at the northern end of South Korea and is only about 700 meters away from the southernmost part of the Demilitairized Zone (DMZ). When the rail line is eventually opened for passenger trains, Dorasan Station will be a gateway to not only North Korea, but China, Siberia and Europe. The station was made famous on 20 February 2002 when President George W. Bush and President Kim Dae Jung of South Korea visited the station and signed railway ties. 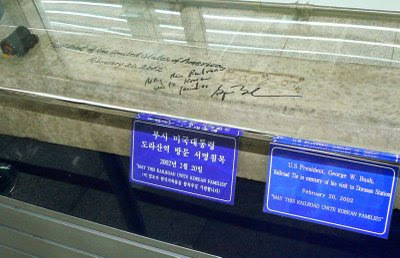 The photo above shows George W's autograph on one of the ties and a message which reads: "May this railroad unite Korean families". 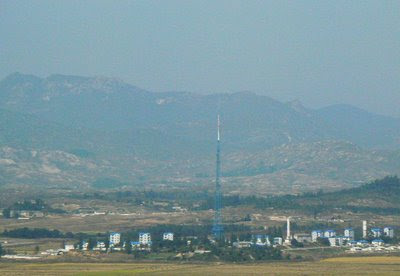 This photo was taken from the Dora Observatory looking across the Demilitarized Zone (DMZ) and into North Korea. The flag-tower at Kijong-dong, near the centre of the shot, is claimed to be the tallest flagpole in the world. Alas, the wind wasn't blowing very hard so the North Korean flag was hanging limply. This shot was actually hard to take because there are restrictions as to where you may stand when taking photos of North Korea. You have to stand several metres back from the barrier holding your camera above your head shooting in the general direction of the subject. I took about a dozen photos like this, only one or two of which were any good. The photo was taken on a bus trip to the DMZ with some family members who were staying with us last week. I will post some more images from that trip in the coming days. 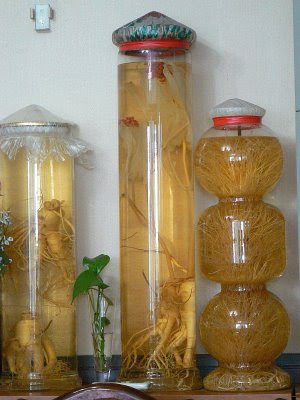 Jars of Korean ginseng in a Samgyetang restaurant in central Seoul. I am told by my Korean friends that the best ginseng is six years old and that it is supposed to be good for all manner of ailments and medical conditions. Samgyetang, or ginseng chicken soup, is one of my favourite Korean dishes. It is real comfort food for me and a pleasant, less spicy meal option. It is traditionally eaten by Koreans on three specific days during the long and steamy summer. It is supposed be a healthy food and also help one deal with the oppressive days of summer. My little Canon IXUS 80 IS has a feature that allows you to pick a colour in a scene and change it to another colour in the camera as the photo is taken. 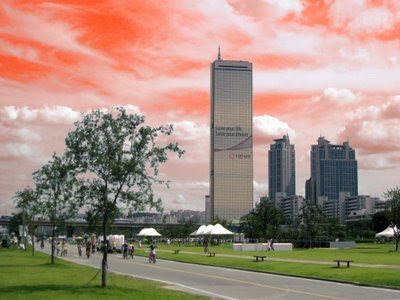 I took this picture of the 63 Building on Yeouido and elected to swap red for blue. 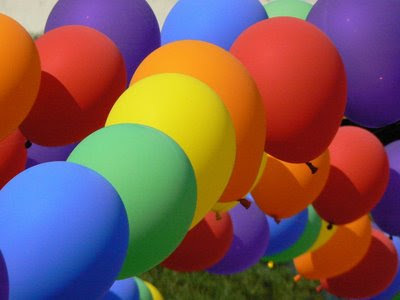 The above is the result. 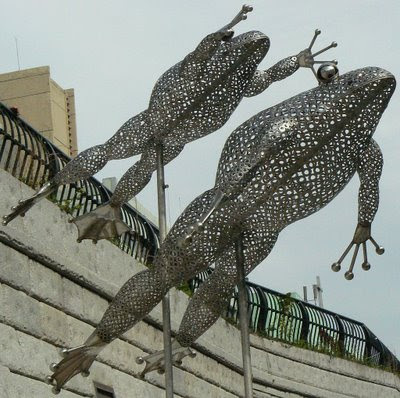 Another of the Cheonggyecheon sculpture series. Alas, this photo should have gone up yesterday, but I was travelling and so missed a post. I'll make up for it by putting up another a little later today. 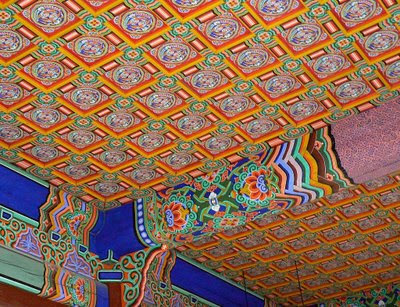 Ceiling detail of Geunjeongjeon the Throne Hall, at Gyeongbok Palace (Gyeongbokgung). This hall is where where the king granted audiences to his officials, met foreign envoys and presided over large official functions. 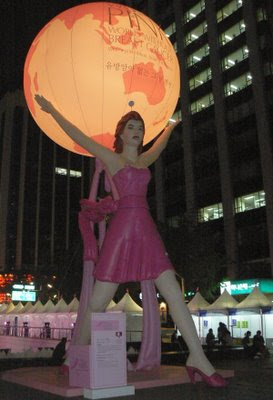 A giant inflatable woman holding a globe of the world stands at the beginning of Cheonggyecheon as part of a breast cancer awareness campaign. 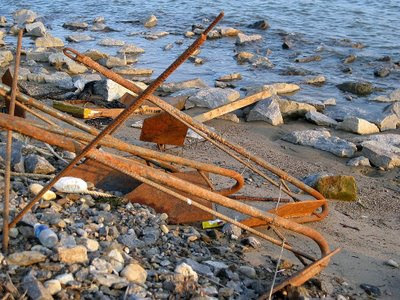 Various items thrown or washed up on the south bank of the Han River. 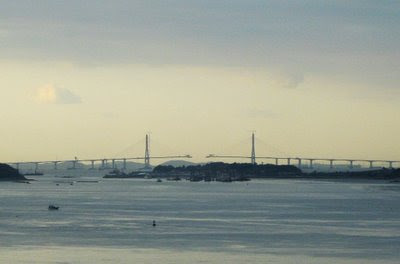 I have shown previously in this blog the Gwangtong Bridge. 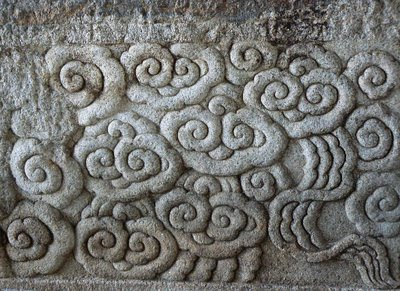 The above photo shows some of the ornate carvings on the stone blocks beneath the bridge. 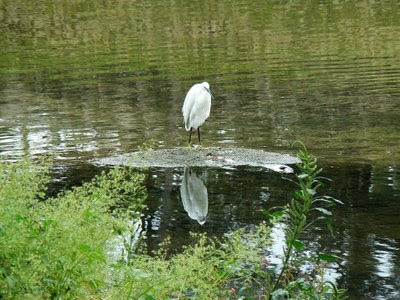 A waterbird stands on a small sandbar in the Cheonggye stream, seemingly admiring its own reflection. A hand-held, and slightly out-of-focus, evening shot of the fountain at the Seoul Arts Center. 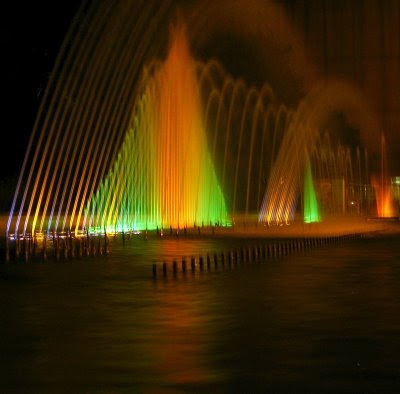 The coloured lights and patterns made by the water jets change to the accompanying music. The photo was actually taken last Friday evening just after we had been to a concert given by Omara Portuondo of "Buena Vista Social Club" fame. She performed a selection of numbers including some from her new CD entitled "Gracias" as well as the Korean classic "Arirang"; the latter being very well received by the largely Korean audience. Omara is a very charismatic performer and at 78 years of age she is truly amazing! Here is another one of the sculptures put on display recently beside Cheonggyecheon (see also: "Bear in A Chair"). 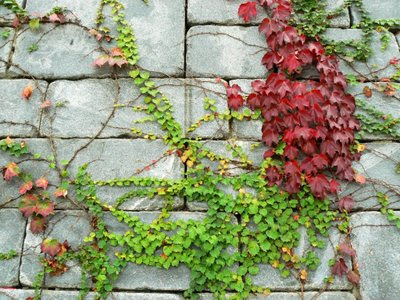 Ivy growing on a wall in central Seoul. 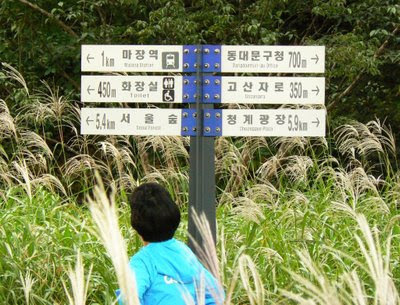 A walker pauses to read a sign beside the Cheonggye stream. Which way shall I go? A tight-rope walker in traditional dress performs for a crowd at Seoul Plaza in front of Seoul City Hall. Clicking on the image above will load a larger version which give you a clearer idea of the skill of this gentleman. 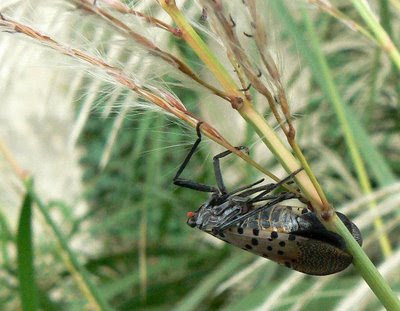 An unusual looking insect on some grass growing near the Han River. The subject for Theme Day this month is "Lines". Unfortunately, I was not organized enough this month to register in time, but I thought that I'd make a themed post anyway. For the September Theme Day my post was, in part, a tribute to the members of the armed forces of the United States who served in the Korean War. 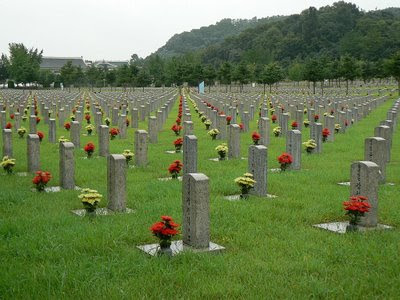 This month I thought that I would close the circle and pay tribute to the Koreans who fell in the service of their country during the Korean War and other conflicts. I have shown previously in this blog other photos I have taken at the National Cemetery. I have visited there on many occasions as it provides opportunities for long peaceful walks through beautiful gardens away from the hustle and bustle of Seoul city streets. However, each time I visit I can't help but be moved by what appear to be the seemingly never ending lines of tombstones stretching off into the distance in all directions.